A British human rights activist who escaped a forced marriage, set up a dedicated charity to help victims of honour-based abuse and forced marriage, and helped change the law to make forced marriage a crime has been named winner of a prestigious global award created in honour of the Scots Bard. 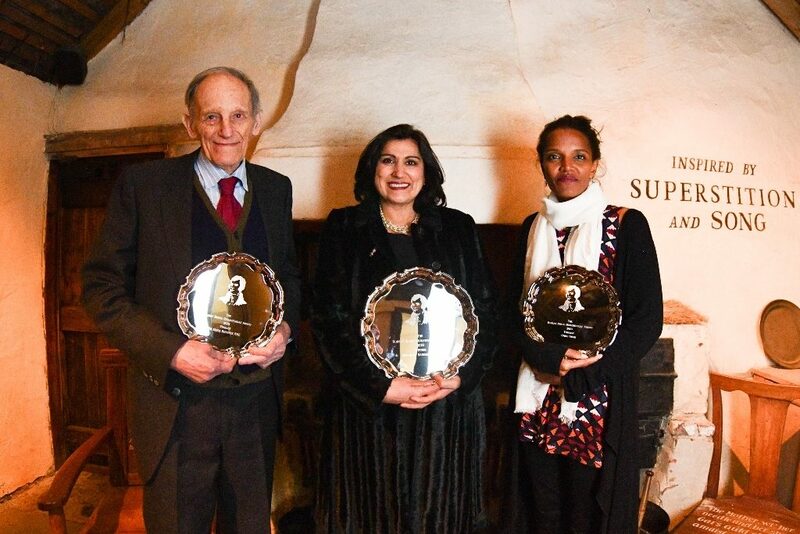 Campaigner Jasvinder Sanghera CBE was presented with the Robert Burns Humanitarian Award at an intimate ceremony in Burns Cottage, Alloway where Robert Burns was born almost exactly 260 years to the day. Part of the Burns an’a’that! Festival 2019 and Burns 260 celebrations, the Robert Burns Humanitarian Award (RBHA) is supported by South Ayrshire Council and Scotland’s Winter Festivals – a programme of events funded by the Scottish Government and managed by EventScotland. The award recognises courage, commitment, inspiration and hands-on humanitarian efforts from people of any nationality, race, age or gender. Jasvinder’s story was deemed by the award judges to exemplify the values that Burns himself stood for in terms of humanity, equality and freedom for all. Born in Derby, Jasvinder’s humanitarian journey began when she escaped a forced marriage by running away from home at the age of 16 – only to find herself disowned by her family. Her four older sisters were taken individually to India to enter forced marriages. It was after one of her sisters committed suicide to escape the domestic abuse of her marriage that Jasvinder decided to found Karma Nirvana – an award-winning charity that supports victims of honour-based abuse and forced marriage. Jasvinder’s efforts over a decade of lobbying government and campaigning were pivotal in creating a new law that made forced marriage a criminal offence in the UK. The legislation has now been in place for five years and this had led the way for the present consultation into the mandatory reporting of forced marriages. As well as a survivor, activist and campaigner, Jasvinder is an author, with her memoir Shame being described in the House of Lords as a ‘political weapon’ and novels Daughters of Shame and Shame Travels making it to The Sunday Times’ bestseller lists. Most recently, Jasvinder raised significant debates in The House of Lords by sharing her personal experience and being the first complainant of sexual harassment and bullying. This has led to numerous individuals reporting and an independent inquiry that will create greater future changes. Chairman of the RBHA judging panel, and South Ayrshire Council leader Douglas Campbell, said Jasvinder stood out as an exemplar humanitarian, putting others first and making a difference. He added: ‘Jasvinder has spent more than 25 years standing up for others and making sure they don’t have to go through what she and her family did. She has taken what was a hugely traumatic experience and turned it into a real force for good and a force for change. ‘I have no doubt she will continue to challenge and question this practice with her determination and drive until something is done about it – and I wish her every success. As well as the RBHA 2019 title, Jasvinder receives the equivalent of 1759 guineas (approximately £1,800) – a sum which signifies the year of the Bard’s birth and the coinage then in circulation. Receiving her award, Jasvinder said: ‘I am overwhelmed to be associated with such an iconic figure is an honour. Robert Burns was, and continues to be, an inspiration to many. As an activist, I’ve followed the work of many social reformers and read about the many influenced by Robert Burns, including Frederick Douglas – a slave who went on to be one of the world’s most famous abolitionist. The first book he read was by Robert Burns. Also recognised at the award ceremony were fellow RBHA finalists and runners-up Umra Omar and Dr Denis Rutovitz MBE. Umra is the founder of Safari Doctors, which provides essential medicines and healthcare to people in remote parts of Kenya, improving health and wellbeing, transforming lives and creating communities. Denis is the founder of Edinburgh Direct Aid, which assists victims of natural disaster and war around the world, initially delivering aid convoys to Bosnia – often under sniper fire. Denis has personally raised thousands to help others, fundraising for his 90th birthday by running two 10k races to support refugee twin brothers through a three-year degree course at the Lebanese International University.